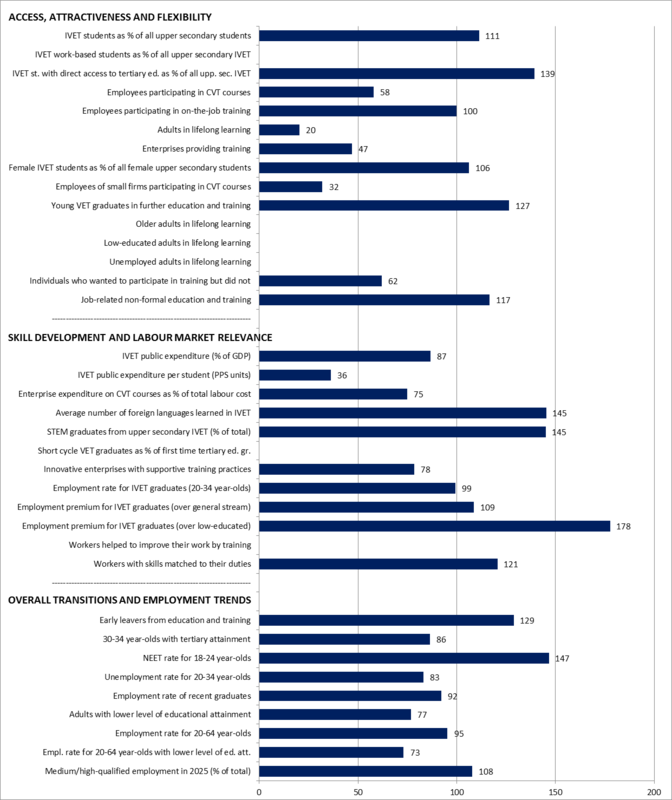 Bulgaria’s performance on a range of indicators selected to monitor progress in VET and lifelong learning across the European Union (EU) is summarised below. The chart compares the situation in Bulgaria with that of the EU, based on the most recent data available (this differs by indicator). Data in the chart are presented as an index where the EU average equals 100. 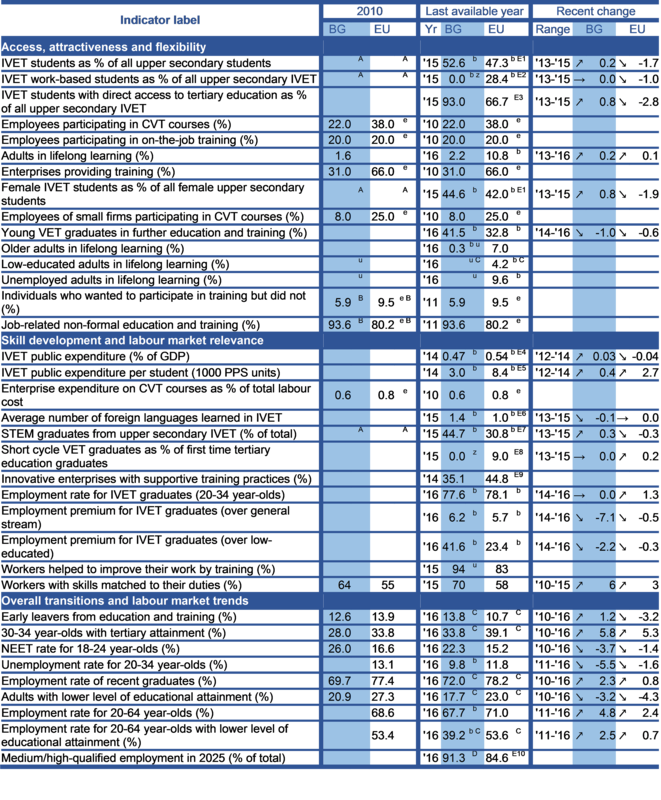 If the index for a selected indicator for Bulgaria is 100, then its performance equals the EU average. If the index is 90, its performance is 90% of (or 10% below) the EU average. If the index is 200, Bulgaria’s performance is twice (or 200%) the EU average. For some indicators, such as early leavers from education and training, a country is performing better if its score is below that of the EU average. The percentage of all upper secondary students participating in IVET in Bulgaria is 52.6%, higher than the EU average of 47.3% (in 2015). The situation differs for adult participation in lifelong learning; at 2.2% this is much lower than the estimated EU average 10.8% (in 2015). Since 2010, the percentage of adults participating in lifelong learning has increased little in Bulgaria and remains much below the target of 15% set by the strategic framework Education and training 2020. 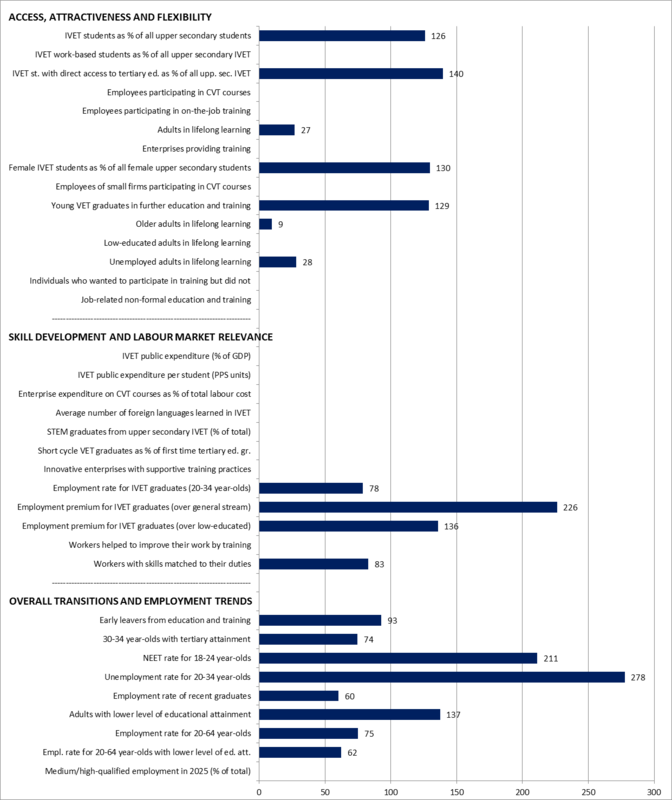 Data from the 2010 CVTS give an indication of the limited extent to which employers provide training to their staff: 31% of enterprises compared with the EU average of 66%. Consistent with this finding, the survey reports that relatively few employees undertake CVT courses (22% in Bulgaria compared with 38% across the EU). In contrast, participation by young IVET graduates in further education and training at 41.5% is higher than the EU average of 32.8% (in 2016). Public expenditure on IVET (ISCED 3-4) per student at 3 000 PPS units is significantly lower than the EU average of 8 400 PPS units. Expenditure as a percentage of GDP at 0.47% is lower than the EU average of 0.54% (data for 2014). The percentage graduating from upper secondary VET with STEM qualifications is higher at 44.7% than the EU average of 30.8%. The percentage of enterprises providing training to support innovation at 35.1% in 2014 is below the EU average of 44.8%. The percentage of workers with skills matched to their duties is relatively high at 70% compared with 58% across the EU (data for 2015). The employment rate for IVET graduates (aged 20 to 34) at ISCED 3-4 (77.6%) is close to the EU average of 78.1%. Their employment rate is 6.2 percentage points higher than for graduates from general education (this is above the EU average premium of 5.7). The rate is also 41.6 percentage points higher than for graduates with lower-level qualifications (well above the EU average premium of 23.4). All these employment figures relate to 2016 and exclude young people in formal or non-formal further education and training. The rate of early leaving from education and training at 13.8% is higher than the EU average of 10.7%. Opposite to the EU average, the overall change from 2010 to 2016 in the rate of early leaving in Bulgaria has been upward (by 1.2 percentage points), keeping it above the Europe 2020 average target of 10% and the national target of 11%. The percentage of 30 to 34 year-olds who have completed tertiary-level education is lower than the EU average of 39.1%. At 33.8% this indicator remains below the national target (36%) and below the Europe 2020 average target (40%). The percentage of adults with low educational attainment (17.7%) is below the average found across the EU (23.0%). The NEET rate for 18 to 24 year-olds is much higher at 22.3% than the EU average of 15.2%. However, after a recent decrease (by 5.5 percentage points between 2011 and 2016) the unemployment rate for 20 to 34 year-olds at 9.8% is lower than the EU average of 11.8%. The change between 2010 and 2016 in the employment rate of recent graduates has been positive (at 2.3 percentage points), but it leaves the employment rate at 72.0% below the EU average of 78.2%.